"Chuck brought strategic direction to our visual design and branding process from startup to maturity. He's an excellent partner for turning vision into visual reality." Working directly with the V.P. of Product Management and the Senior Product Manager, I designed three related websites from the ground up, all while establishing a consistent visual identity across the sites as well as countless forms and ads on third party publisher sites. The projects tested my understanding of information and interactive design and ask more of me than simply visual design. Our main effort went to the consumer experience (matchpoint.com), but also important was the site that was built for the advertisers and a third site created for publishers. 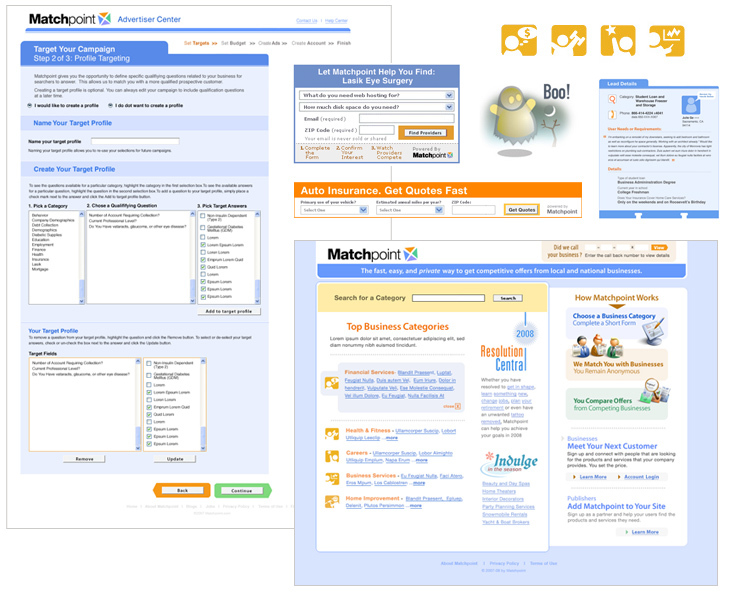 The dozens of flow experiences for matchpoint.com challenged my thinking of what really great interactive design can do.